Traditional, comfortable and simply brilliant: classical beer tent furniture, benches with backrests or tables with extra legroom. Furniture sets "Bambini" & "Shorty"
RUKU beer tent furniture combines comfort with solid construction. Select spruce wood, high-strength two-component adhesive, rear-bolted stacking strips and powder-coated fittings ensure maximum stability. The furniture sets come in a range of table widths, colours and variants, including benches with backrests, benches without backrests, tables with normal frames or with special, comfort-adding frames with extra legroom. RUKU has been making furniture for party tents and beer tents since the 1950s. Numerous breweries and event organisers trust RUKU’s many years of experience. 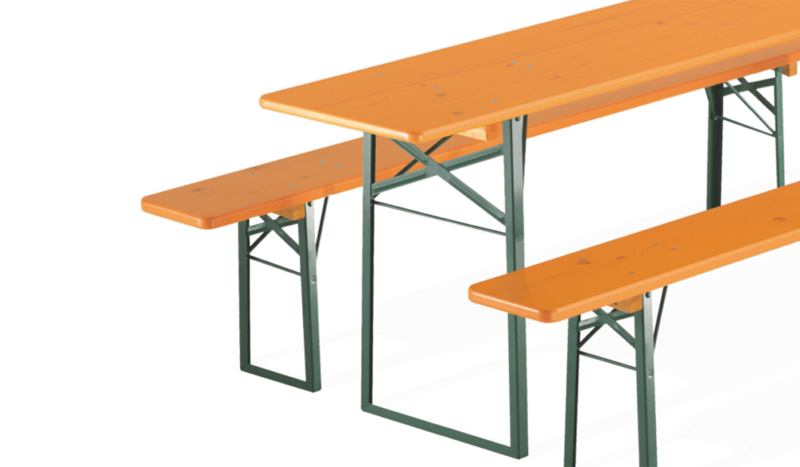 The famous Munich Oktoberfest makes use of our high-quality festival furniture sets on a regular basis. Choose your favourite from a range of 3 colours for your table and bench set. Pine, natural or orange - the perfect colour for your taste. Choose the tables and benches that match your requirements. At RUKU, you can create your very own and individual folding table and bench set. Our table with extra legroom offers more room than our classic table. 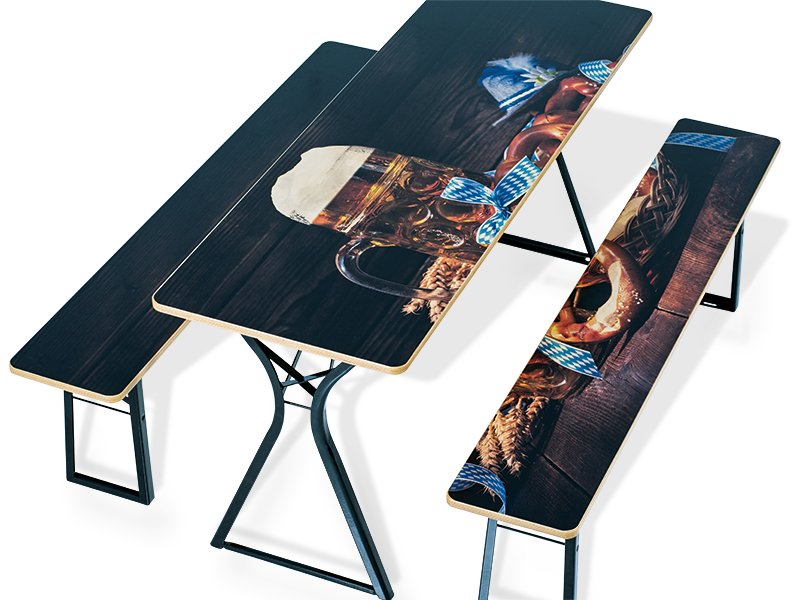 Its slim, x-shaped design makes it the perfect table for close sitting in crowded party tents. Kiln-dried spruce wood, powder-coated fittings and rear-bolted stacking strips guarantee maximum stability. This table is 2.20 m long and 50 cm wide. It is available in the colours pine, orange or natural. Sturdy and reliable, even when the party is in full swing: our table with normal frame is part of our classic beer tent furniture product line. It comes with a base frame in dark green or dark blue, and is perfect for any occasion. The tabletop consists of kiln-dried spruce wood, treated with a patented UV-varnish. The table is available in orange, pine or natural -with either 50, 67, 75 or 80 cm width. RUKU offers benches with backrests for all those who’d prefer to be a little more comfortable. The bench with foldable backrest is made from robust spruce wood. Available in pine, orange and natural. Dark green frame. 27 cm wide and 2.20 m long, the bench with backrest holds about four people. 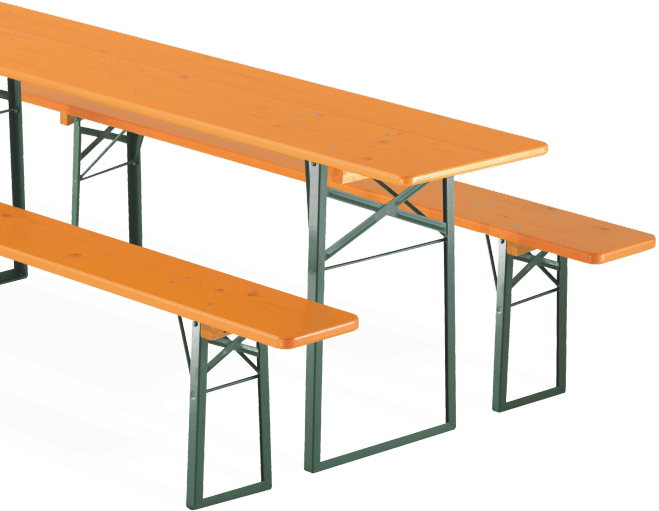 Classical, practical, sturdy: the RUKU bench without backrest is an optional item in our classic beer tent furniture range. This bench is 2.20 m long and available in width of 25 or 27 cm. The colour range includes pine, orange and natural. the frame is available in dark green or blue. Third stacking stripThe third stacking lath is a standard feature for all our RUKU folding tables and benches, so that the furniture sets won’t be damaged by scratches during stacking, transport and unloading – in this way, they will remain nice and flawless. Patent-registered C-profileThanks to the new, innovative C-profile, the stability of the base frame is increased by up to 20% compared to conventional base frames. This increases the buckling resistance as well. RUKU plastic slidersPrepared for fragile surfaces: holes in the footprint for optional RUKU plastic sliders. UV-varnishThe UV-Nano-glaze is solvent-free, environmentally friendly and food-safe. The glaze is elastic in itself and adapts to the shrinking behaviour of wood. This guarantees optimum adhesion of the UV glaze to the wood and minimises absporption of moisture. 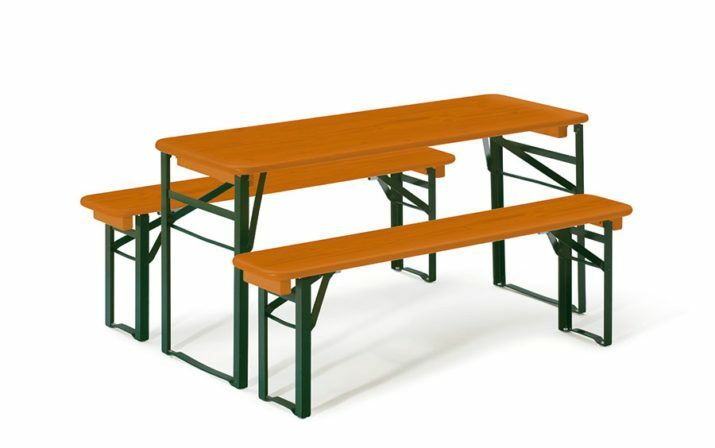 Our folding table and bench sets are characterised by durability and reliability. 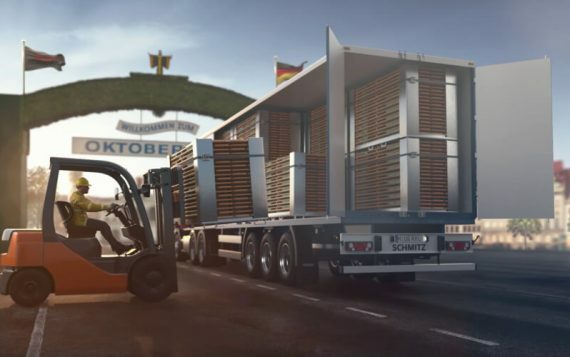 Outstanding resistance against mechanical loads, weather effects as well as wear and tear has made this folding set the first choice of thousands of satisfied customers for the past 60 years. Our folding table and bench sets can be designed according to your wishes: Available in different sizes and various colours with individual printing, they’ll leave no wishes unfulfilled. Benefit from the unique UV-varnish and the stable C-profile of the base frame. 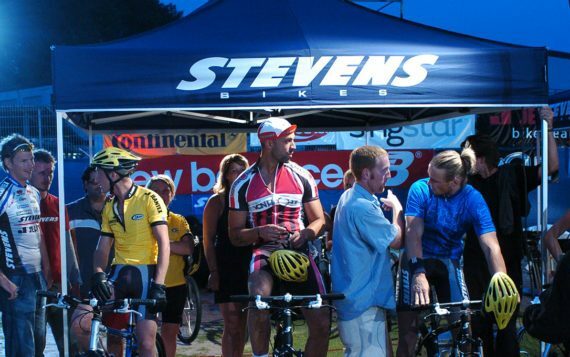 With the stable and dismountable container, you can move and protect your folding bench and table sets before, during or after events. 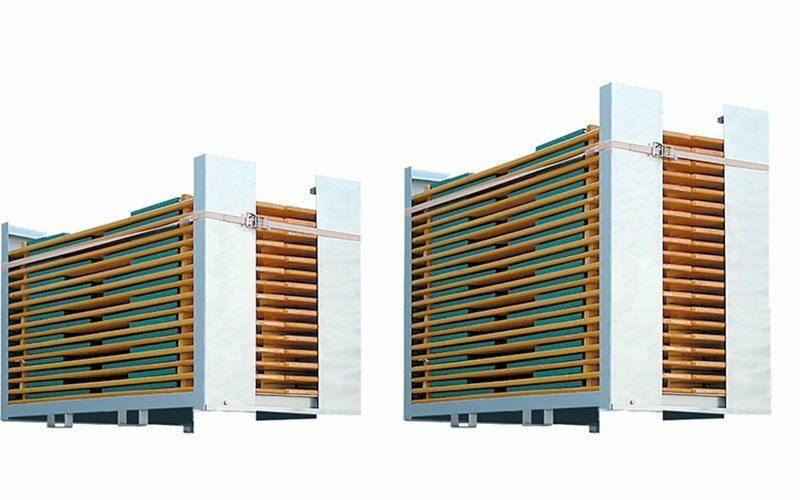 The boxes are stackable in full or empty state thanks to a robust design. Turn your furniture set into an absolute highlight. Each table and bench set can be customised – as an advertising medium, for special occasions or as theft protection. 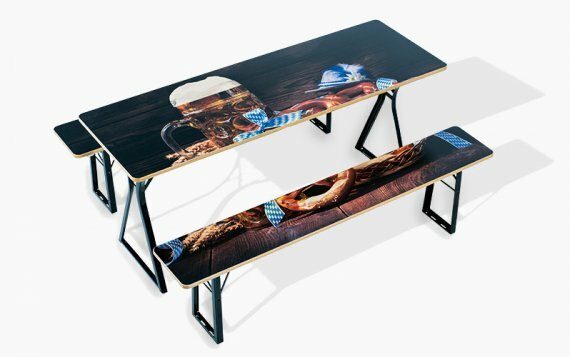 Large-scale logos, colourful writings and even whole photographs can be printed onto your folding table and bench set. Table and bench are 110 cm long and 40 and 20 cm wide respectively. The height is 54 cm. The “Bambini” set comes with plastic sliders so that it can also be used in the nursery, terrace or kitchen. The RUKU furniture line “Shorty” comes into play when space is tight. The shortened version of the classic RUKU folding table and bench set is just 108 cm long, whereby the table is 67 cm wide and the bench is 33 cm wide. The base frame is only available in black. The “Shorty” line is ideal for balconies and offers comfortable seating for 4 persons. Do you need any help or do you have questions concerning our products? Just contact us! 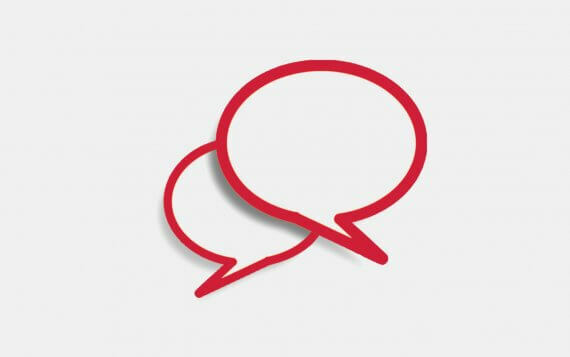 Our trained staff will answer you within the shortest time. Do you wish for a printing? Your enquiry has been submitted and will be processed as soon as possible.